Today is World Smile Day. When I read about this day I immediately thought about a smile toast stamp that I had not yet used. I think that my vegetable smile may look a little creepy. This was an easy lunch to make. This entry was posted in Bento / Cute Food, Food and tagged bento, lunch, vegetarian. Bookmark the permalink. This puts a smile on my face! 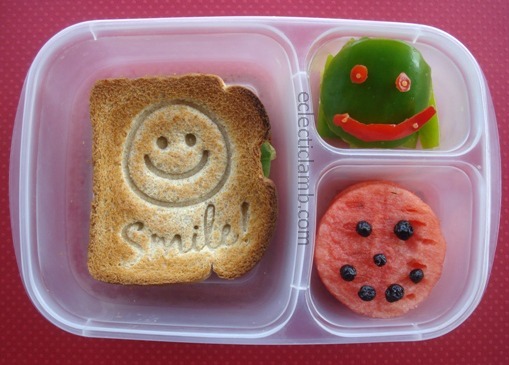 :) Such a lovely and creative bento and I love the detailing on the pepper and watermelon. Another cute one. I liked the stamped toast. Thank you! It was easy to use the stamp. These crack me up! But, yes, the veggie one looks a little psycho . . .
Too cute…THIS made me smile! Thank you! I am so glad! Definitely put a smile on my face!